To create a rotation, you must double click on on the point that want to make the center. Once you have declared a center point, you need to highlight the figure that you would like to rotate. Go up to the Transform Menu and select Rotate. You should see a dialog box that looks like the one to the right. Change the value to the desired degree of rotation and click OK. Highlight any figure on your screen that you would like to translate. Go up to the Transform Menu and select Translate. You should see a dialog box like the one to the right. 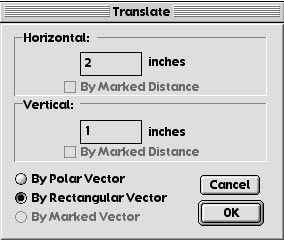 By default, the Geometer's Sketchpad will select By Polar Vector. We need to select By Rectangular Vector. Don't forget this step or the results may be confusing to you. Select how far to the left or right you want the figure by changing the value of Horizontal. Select how far up or down you want the figure by changing the value of Vertical. Negative numbers go left and down. Positive numbers go up and right. To create a Reflection, you must first have a mirror. To make a mirror, double click on either a segment, line, or ray. The figure will bounce out at you. Then select a figure that you want to reflect across that mirror. Go up to the Transform Menu and select Reflect. To create an animation, you must select a point(s) that you want to move and select a path. Paths can be segments, lines, rays, or circles. Once you have a point and a path selected, go up to the Edit Menu and down to Action Buttons. A Sub-Menu will appear and from this menu select Animation... You will have the choice of Bidirection, Once, and One Way. Choose according to the ride you are trying to simulate. It is possible to create more than one animation for each Animate Button. For instance, the animation to the right has two points moving on two different paths. To accomplish double animations, select the point and then the path and repeat. You must use the shift key to select multiple items.